Young Mister's readiness to draw so authentically on a wealth of different styles make you think that this outfit really aren't as young as they claim to be. 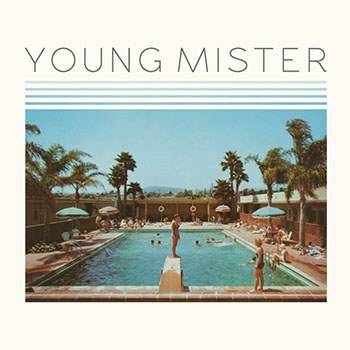 For a group whose apparent "youngness" is such that it necessitates naming themselves "Young Mister", this group show a mature amount of scope on their debut record. Largely the brainchild of songwriter Steven Fiore, Young Mister aren't actually as young nor as formal as their name would lead you to believe. In fact, Fiore himself has six years of recording experience under his belt, and has even performed alongside Jeff Goldblum's jazz band. But on this debut record, Young Mister show they're capable of some very considered songwriting with or without the math guy from Jurrassic Park. The record opens with "The Best Part", a shuffle-beat affair which channels the energy of late '70s summer classics (think along the lines of Toto and Electric Light Orchestra). Young Mister have themselves identified ELO as a big influence on the record, and they waste no time in showing their appreciation for classic rock. But don't be fooled -- this group isn't just here to impress Baby Boomers. Brass hits are thrown in to nod at modern takes on soul and R&B, and the production value and energy are such that the track won't alienate listeners who may not be familiar with as many retro outfits as Young Mister are. The throwbacks continue on "Would It Kill You", before Young Mister take a stylistic turn. The vocal melodies and stylings on "American Dream Come True" are decidedly reminiscent of James Mercer from the Shins. This likeness epitomises the direction in which Young Mister take the album from here -- fans of early millenial indie rock will appreciate the melting pot of folk, psychedelia and melodic songwriting which Young Mister unearth towards the middle of the album. The album is especially Shins-y on "Carolina", which marks the halfway point. From here, it seems only natural for the group to marry retro and indie over the remainder of the album. "Anybody Out There" and the ballad-style "Everything Has Its Place" are the two most clear examples of this blending. There's a certain feeling that Young Mister are at their most comfortable on these tracks, as they work so effortlessly with a grab bag of stylistic influences. The album comes up slightly short at just eight tracks, which may disappoint some, but the fact that it's practically devoid of filler should leave listeners satisfied. The Americana-influenced single "Pasadena" is an appropriate closer for an album hallmarked by so many different stylistic influences. If this single took your fancy before having heard the album, however, suffice to say that the Americana dabblings are just that: dabblings, really only surfacing on "Pasadena". The most head-scratching thing about the record is that the group claim to fit into the "melodic slacker rock" genre. "Melodic", yes, but the album's production value, carefully balanced genre hybrids and ambitious throwbacks are the last thing you'd expect from a "slacker" outfit. Nevertheless, Young Mister strike a rare balance between energetic yet considered songwriting and accesibility to a myriad of different listeners. In short, it's just a fun album to listen to.